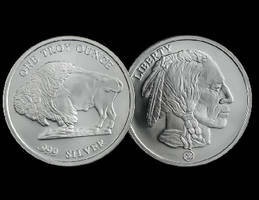 Silver Coin is inspired by buffalo nickel. Measuring 39 mm in diameter and 2.5 mm deep, 1 oz Buffalo Round is made of .999 fine silver and features RMC mint mark, making it IRA and RRSP-acceptable. Obverse of design depicts buffalo with words One Troy Ounce and .999 Silver stamped above and below. Reverse shows Native American Indian in profile accompanied by word Liberty and RMC mint mark. MIAMI -- Republic Metals Corporation has announced the addition of the 1oz Buffalo Round to its line of fine silver products. This round, inspired by the buffalo nickel, is made of .999 fine silver and features the RMC mint mark, making it IRA and RRSP-acceptable. The obverse of the design depicts a buffalo with the words "One Troy Ounce" and ".999 Silver" stamped above and below. The reverse shows a Native American Indian in profile accompanied by the word "Liberty" and the RMC mint mark. Click on the link below for more information on Republic Metals' 1oz Buffalo Round. https://www.republicmetalscorp.com/English_index/products/rmc_1_oz_ag_buffalo_round.html. Headquartered in Miami, Republic Metals was established in 1980 and has since grown to become one of the largest and most respected primary precious metals refineries in the world. Throughout its illustrious history, Republic Metals has displayed excellence in precious metals refining in a manner that is considered environmentally friendly, as demonstrated through its long-standing ISO14001 registration. Republic Metals, an ISO9001:2008 registered company, holds listings on the London Bullion Market Association (LBMA), the Chicago Mercantile Exchange (CME group), and the Shanghai Gold Exchange (SGE) with certified memberships from the Responsible Jewellery Council, Conflict Free Smelter Initiative, and Ethical Alliance. As an LBMA-designated "Responsible Gold Party," all business conducted by Republic Metals is performed in accordance with its stringent Patriot Act compliance and supply chain policies.